Posted by ronannarbor in Detroit, Entertainment, musical theater, Theatre. I can’t recall a cast and production of a Broadway tour to hit Detroit that is this excellent from top to bottom. 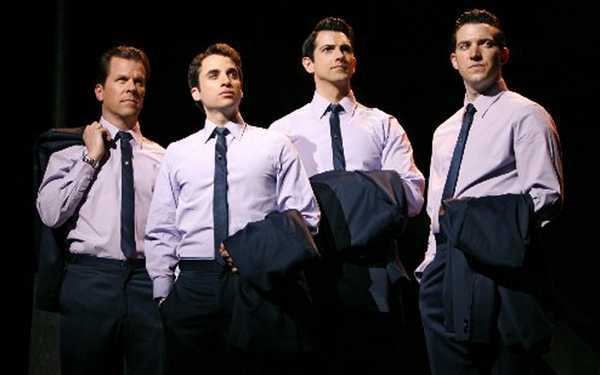 JERSEY BOYS is the ticket for a cold winter night in Motown, and it’s proving to be a huge audience favorite. This is not the first time I have seen Jersey Boys. 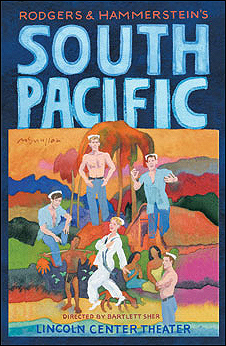 I saw it in NYC when it first opened, and in it’s sit-down production in Toronto (where it is still playing). It also has a long-running sit-down in Chicago. But this is the first time I have seen an audience reaction like that in Detroit. First, the production — this is a show that was developed on the road in La Jolla, so it’s an easy production to tour — it looks exactly like the Broadway and sit-down productions because of it’s easy to transport set/video screens/scaffolding. It looks marvelous. It also looks fabulous inside the Fisher Theater, itself a throwback to 60’s glam. Second, the cast — this is a cast that is comprised of members of the original cast, other productions across the country, and is a true ensemble. Sure, the cast members don’t look like the real people, and at times they don’t even sound like the Four Seasons — but it really doesn’t matter. What you have here is a talented acting/singing/dancing cast that truly form a blended family on stage. You really believe these people are real, and you care about them. Third, the audience — I have never seen a reaction like that in Detroit at the performance of Jersey Boys that I saw last week. The more reserved Broadway audience cheered and clapped; the Toronto audience was appreciative but generally stoic — but the last time I have seen this type of super-charged audience reaction to a show was the original Dreamgirls in NYC in 1982. The audience is positively electric — they cheer throughout – stand and cheer often, and it’s a marvelous feeling to be in a theatre and watch that magic occur. The first spark comes with the transformation on stage, “Sherry”; and it carries on to the end. The highlight of the second act is the surprisingly emotionally-charged “Cant Take My Eyes Off of You”. The energy is so palpable you can feel it — and the cast thrives on that energy and notches up their performances as the show goes along. They grab you, and they hold you there. It’s the best tour I’ve seen come through Detroit in 15 years. And I wonder why it took so long to get here — it’s a perfect fit for a blue-collar town, and the sound created by Franki and the Four Seasons draws as much on Motown as it does the Jersey beat. Highly recommended – even if you have seen it already. This is something special – and it’s guaranteed to get you out of your seat and feeling really fine on the way home. And that feeling lasts for days. The line at the souvenir stand attests to this, as happy Detroiters snap up copies of the Original Broadway Cast Album of Jersey Boys on the way out the door. It’s that kind of show. You want to take it with you.